An Original Indulgence. Introducing sTOLI CHOCoLAT RAZBERI. www. .com FOLLOW US ONLINE: facebook.stoli.com or @Stoli GREAT COCKTAILS START WITH PESPONSIBLE MEASURING. SAVOR STOLI RESPONSIBLY. 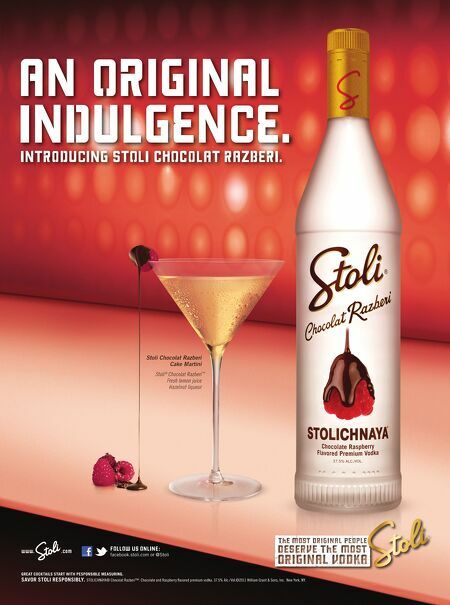 STOLICHNAYA® Chocolat Razberi™. Chocolate and Raspberry flavored premium vodka. 37.5% Alc./Vol.©2011 William Grant & Sons, Inc. New York, NY.